This week we’ll be joined by everyone’s favourite Romance author, Zoe York! 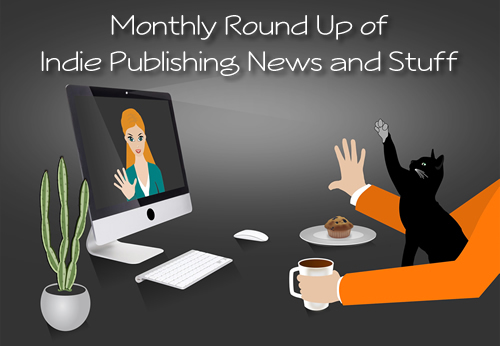 Author Earnings: Indie eBook Market Share is down! After two and a half years of quarter-over-quarter growth, Indie eBook market share shrinks significantly. Most of the slack seems to have been picked up by Amazon Imprints with a small increase from other publishers. Bookbub becoming more predominantly trad / small publisher friendly. Indies are down to about 15% of ebooks advertised through their email marketing. Data Guy believes this probably only accounts for 0.5% of the shift. KU – authors going wide especially after the KU glitch and the page flips issue. Without page reads those ebooks are now getting less visibility at Amazon but have perhaps shifted the sales to other vendors. The AE spider only crawls the American site. Perhaps the election could be proving far more entertaining than ebooks? Stephen King claimed that Amazon was deceptively marketing the other ‘Stephen King’s work as his work for several years and they had not been able to resolve the issue. He called on his followers to report this to Amazon. Since then he was also made aware of B&N doing the same. B&N were able to rectify that problem in 4 hours. The latest update says that Amazon is now making the other Stephen King use his middle initial and also includes a note on all of this books stating that there are a number of authors called Stephen King and if you want the author of The Shining and The Stand to visit the link provided. Reedsy–a site that provides a marketplace of professional editors, designers and marketers to support authors–has launched online publishing courses. They’re provided in bite-sized chunks and serialised over 10 days. Courses currently available cover writing, publishing and marketing. October also saw Amazon release a new version of its Kindle Publishing Guidelines (PDF). The new changes include ToC be placed in the front of the eBook as well as other small details that don’t seem like they’ll be an issue for most of us–unless you use images of tables, those should be html tables now. Now, when you set up a preorder it says you must upload your final manuscript at this point, however, this is not the case. You can still upload a draft or part of your manuscript and then upload the final manuscript later. What has changed is that they are removed the 10 day before going live deadline. However, you will no longer receive those reminder emails about the upcoming publication date. @David Anson David Tennant is actually David John McDonald and he had to change his name for the same reasons. The numbers are down because everyone filled their Kindles and have to read instead of buying. Aren't most small publishers the authors themselves? @writerwade @David Anson Hi Wade. How's life on the coast? The mountains are getting cold! @David Anson @writerwade Yes, like this time of year. The author earning's report: http://authorearnings.com/report/october-2016 <-- indies are down! @BatmanErica Does "down" normalize for number of indies in the market between the two points compared? And we're off and running. Feel free to chime in here.